If you never had to prepare another meal or wash another dish, yet savored restaurant-quality breakfast, lunch and dinner every day, wouldn’t that be grand? At The Neighborhoods by TigerPlace, that dream can become your reality. Our skilled chefs, together with our registered dietician, craft flavorful and nutritious delights for our residents every day of the week. Nutritious and delicious food is always our goal. We are also happy to accommodate special dietary needs, incorporating them into our menus. If you are considering a move to our community, please join us for a meal as our guest. Once you are a resident, do feel free to invite your friends and family to accompany you to a meal, not just on special occasions, but any day. We love to have company! Have a special family recipe? Why not share it with our chefs? We do our best to honor special requests. The varied fare at The Neighborhoods by TigerPlace includes home-style comfort food, plus special dishes to tantalize the taste buds. Our breakfasts are made to order. Both lunch and dinner menus offer two options each, as well as an a la carte option. Healthy snacks are always available, too, for those hours between meals. We want you to have food which nourishes your body and warms your soul. Dining together in your intimate neighborhood dining room is one of the highlights each day at our community. 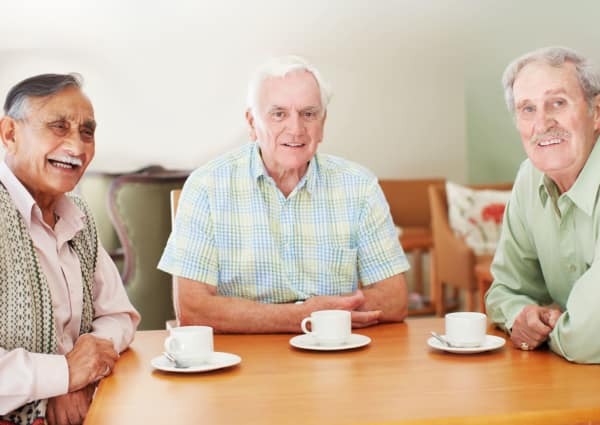 At meal time, we encourage our residents and staff to move around, spread the joy, and make new friends.